I was recently talking to a friend about the inexplicably “cool” things we did in middle or high school, like wearing overalls (and wearing one strap undone), walking around with one pant leg up and one pant leg down, and carrying your 7,000 lb. Jansport backpack with only one strap; no matter how inevitable the scoliosis onset would be, you didn’t dare put that other strap over your shoulder in public for fear of being branded a dork for life. Another great mystery of my school days was my hatred of breakfast, and how “cool” I considered my “talent” of being able to make it all the way to 6th period lunch without eating a thing. I remember legitimately bragging about it. Now that I’m [much] older and wiser, I know that breakfast is crucial to growth and brain function, and more importantly to my teenage self, weight control. Studies show that overweight adolescents and adults are less likely to break that fast each morning than their thinner counterparts, so when you think you’re doing your waistline a favor by skipping a meal, you’re actually doing the opposite. Nowadays, breakfast is what gets me out of bed in the morning, and if I skipped breakfast, there’s a good chance I’d have the shakes less than 10 minutes in my morning commute. Most mornings, my breakfast is a simple bowl of oatmeal or a protein shake, but on the weekends I tend to get a little more adventurous. Lately, I’ve been cranking out some “clean eats,” and I’ve been super pleased with the results. 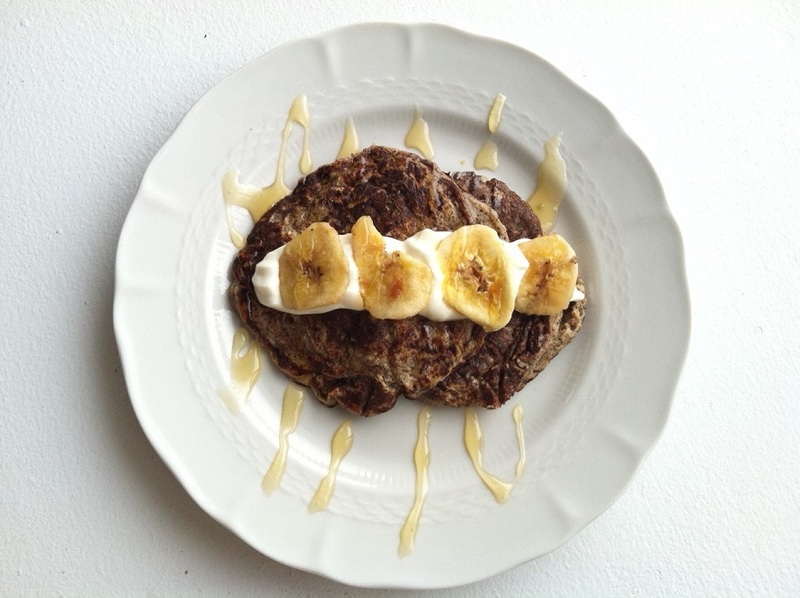 This weekend, I made some espresso banana pancakes, topped with protein “whipped cream,” banana chips and honey. Even if you don’t have the “clean” version of these ingredients, your pancakes will still come out great. Oh, and don’t mind the coloring; the espresso made the pancakes look like sausage patties, but I promise these were fluffy and delightfully unmeaty. Combine all pancake ingredients in a blender or food processor until well combined. Heat griddle or frying pan over medium heat (these cook fast), and add a very small amount of coconut oil. Drop batter onto pan and allow to cook until you see small bubbles and the edges are solid enough to flip (little more than one minute). Flip and cook other side (45 seconds to a minute). Use your best judgment to avoid burning, but don’t be fooled by the dark espresso color; make sure cakes are fully cooked. For the topping, combine whey protein and Greek yogurt in a small bowl and whip quickly to combine. Spread across pancakes, top with banana chips (or fresh banana slides, but I preferred the slight crunch) and drizzle with honey. Cost? $0.30 banana, $2 oats, $2 espresso, $2.99 cottage cheese, $2.99 Greek yogurt. Overall success relative to expectations? 7 out of 10 really enjoyed how the espresso flavor came through in the pancake, and crunch of the banana chips was a nice touch. I would definitely make these again. Perhaps they even have more staying power than my one-pant-leg-up-one-pant-leg-down overalls.